It has been a year since Georgia and Shawn Mason were following the trail to the Presidency and blogging about it. A year since Shawn lost his sister at the hands of a zealot, knowing he didn't act alone. Watching Shawn continue on without Georgia was heartbreaking, although she never seemed too far away with him constantly talking to her in his head, or out loud. His colleagues think he is crazy, but then so does Shawn. It doesn't stop them from working well together. When Shawn is approached by a doctor convinced that the government is hiding work that could help find a cure to the zombie virus, he knows this could very well lead to the people who killed his sister. The action never stops in this book. I enjoyed the opening chapter, which mirrored Feed with its zombie-teasing. With vehicles and explosions and chases through buildings, Shawn and his crew have very little down time. I also enjoyed seeing more of the crew, with Maggie and Becks being brought forward to adapt to the roles left by Georgia and Buffy. This is not a book for romance seekers, although the idea is touched upon briefly more than once. However I think that would have detracted from the story and am kind of glad there is no real interference from emotional ties stronger than those that already bind the group together. 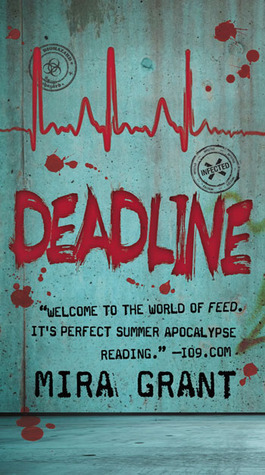 I have been waiting anxiously for Deadline to be available, and once it was finally available for download to my Nook I devoured it. Now I cannot believe I will have to wait another year for the last of the trilogy! The ending blew me out of the water and sent me screaming on Twitter. I haven't had that kind of reaction since Jim Butcher's Changes, and now I have to wait another year for Blackout.